It’s commonly understood that mountain biking and beer go hand-in-hand. Who doesn’t love an ice cold one after a mountain bike ride in the summer sun? One of Park City’s local breweries, Squatters, even named one of their beers “Full Suspension” in ode to mountain biking, noting that it “really smooths out the bumps.” There are quite a few Park City restaurants and breweries that are conveniently located at trailheads all over town. We have a few post-ride recommendations for after you explore one of Park City’s classic mountain bike trails. Located at the bottom of the Armstrong trailhead in the Silver Star area, Silver Star Café offers outdoor seating with a mountain view, plenty of local brews, and live music throughout the week. Menu items include treats like Reuben sandwiches, hearth-fired pizzas, and fresh salads for lunch, and buttermilk fired chicken, wild mushroom stroganoff and bavette steak for dinner. Lunch runs from 11:00 AM-3:00 PM and dinner is served 5:30 PM-9:00 PM Sunday-Wednesday and 5:30-10:00 PM Thursday-Saturday. For a casual and delicious dining experience, with the option to dine outside, head to Sammy’s Bistro. Sammy’s is located in the Prospector neighborhood and sits next door to White Pine Touring, making it a great post-ride spot if you have just ridden Lost Prospector (or anywhere in town). A great place to go for Taco Tuesday or to catch the big game, you’ll sit among locals as you sip an ice cold brew and chat among friends about the mountain bike ride you just enjoyed. 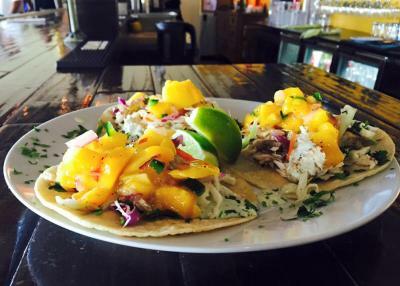 Try the Mahi Mahi tacos with Mango salsa and a margarita. Open 11:00 AM-9:00 PM Monday-Friday, and 8:00 AM-9:00 PM Saturday and Sunday. 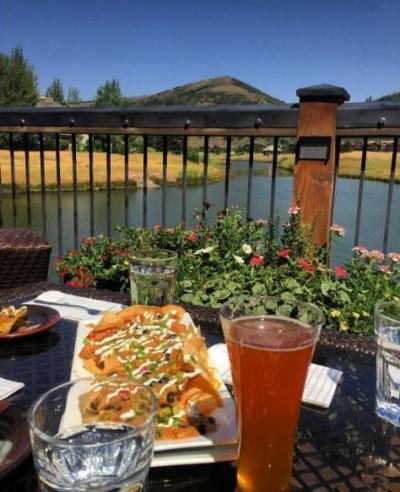 A classic Park City lunch spot, Deer Valley Grocery Café overlooks Deer Valley Resort’s Snow Park pond and is easy to access from many of the lower Deer Valley mountain bike trails. With outdoor seating, amazing mountain views, and a menu with a wide variety of options (beer, wine and cocktails, too! ), there is no doubt that everyone in your biker gang will enjoy both the experience and the food. Summer concerts take place on the deck every Sunday from 5:00-8:00 PM. Open and serving food from 7:30 AM-8:30 PM, Deer Valley Grocery Café is a great choice for any meal and there are plenty of gluten-free, vegan, and vegetarian options. Sitting at the base of Park City Mountain Resort’s Canyons Village in the Grand Summit Hotel, Red Tail Grill offers a unique gastropub menu, with outdoor seating, and stunning mountain views. Its location is ideal for those riding their bikes in the Canyons Village bike park or for those ending their Wasatch Crest Trail adventure by descending into the area. The large deck paired with a great selection of beer and cocktails makes for the perfect après-bike spot. Open daily from 7:00 AM-10:00 PM, Red Tail Grill is a must try for breakfast, lunch, or dinner.